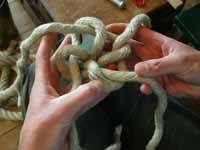 Stonk Knots design in Rope - Working with ropes. Applying the ancient skills of marlinspike knotting, Stonk Knots explores traditional and contemporary themes, transforming rope and cordage into both practical and decorative pieces. We use only high grade ropes, twines and cords, and mostly those made from the natural plant fibres such as hemp, cotton, manila and flax. With an emphasis on neatness of work, traditional sailors' knots like the turks head weave, the monkey fist and the manrope knot are combined with a fresh perspective to create a variety of rope products. Many of our knot projects are tailored to individual requirements and customers' own ideas. Knots are used by everyone, but sailors have developed the greatest variety and concentration of knot tying skills through their use and repair of ropes and rigging. There is a tradition of sailor's fancy work of incredible complexity - bell ropes, chest beckets, whip handles, tied during the long hours of a calm voyage; these skills are borne out of the combination of neatness and function that is required in the simplest of rope use. 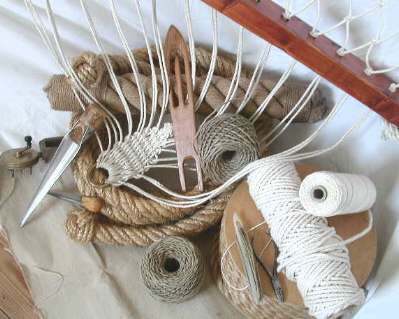 Knots such as The Monkey's Fist and The Turk's Head Weave are tied using the traditional knotting techniques and skills, to create a variety of products. Most of these knots are now considered decorative or fancy knots, although when a ship's rigging was made of hemp rope and required constant maintenance, many of them, and certainly the skills to tie them, served a very practical purpose. Much of the tradition of knotwork and rope maintenance has now been eclipsed by the advent of wire rope, and the long life of synthetic ropes in wet conditions. Modern rope materials and construction have demanded a new set of tricks and many of the splicing and knotting requirements for rope have been replaced by a series of clips and clamps. Although many of these are convenient and quick to apply, the clips and clamps bring problems of their own, creating other points of stress in ropes, and often belie or hide the problem of dealing with the end of a rope. 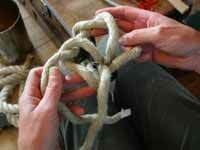 Knots and splices still look nicer, as do the natural fibre materials in which they were originally devised. Very few manufacturers are continuing to operate the machines set up for natural fibre rope making, but even among synthetic ropes, it is increasingly difficult and expensive to find a rope of decent enough quality to work with in the traditional way. It is particularly important for us in the making of interior accessories, that we are able to source ropes that do not feel or look unpleasantly synthetic, or be so loosely laid that the strands easily collapse and with which it is impossible to tie a tidy knot or splice. 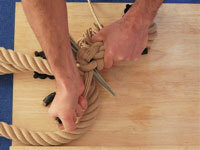 The Manrope knot is a stopper or terminal knot, traditionally used to secure the ends of a ship's manropes which border the gangway, and provide useful handholds. 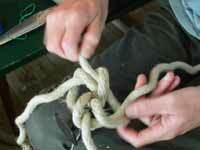 The series of images below show the tying of a Manrope Knot in four strand 24mm high grade hemp rope. 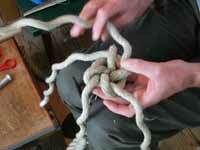 The Manrope knot is tied in at the end of the rope, using the unlaid strands of the same rope, which are then followed round in the patterns of Wall and Crown. To view the finished Manrope Knot, visit the Knots page, on our Stair Ropes and Rope hand rails site, where you can also see images showing several variations of this knot, using different fibre ropes. 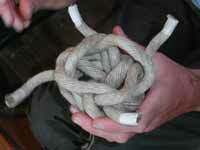 The Manrope knot is a combination of two knots - a Double Wall and a Double Crown. It is often confused with a Turk's head knot, as the pattern of the weave looks similar, however the Turk's Head knot is really very different. Rather than a multi-strand stopper knot which is made at the end of a rope, the Turk's Head knot is one tied from a single strand, usually around another rope, and is known as a "cylindrical binding knot". 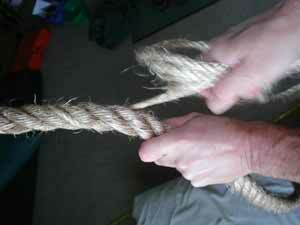 An example of a Turk's Head Knot used as a whipping around an eyesplice can be seen here. 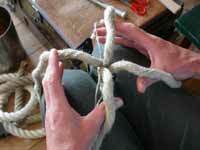 Splicing is an ancient technique used to join one rope to another, or two parts of the same rope. 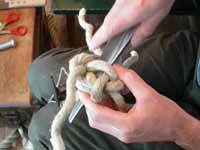 The skill lies in tidily tucking the unlaid individual strands back into the rope. There are many types of splices - long and short splices are made using two ropes or the two ends of the same rope. The strands from each rope end are unlaid, and "married" together. 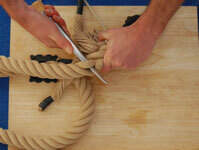 The Sailor's Eye splice is a loop made in the same length of rope, and joined to itself. All splices involve tucking the unlaid strands under and over each other, pulling them through and keeping them neat and tight along the lay. The strength of the splice is dependent on these strands, which, when under strain, bite inwards and secure each other in position. An example of an eyesplice is shown above, using four strand 24mm p.o.s.h. (spun polyester) rope, and made as a loop around an ornate stair rope fitting. 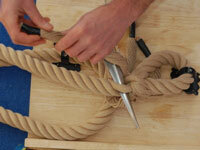 You can see some more eye splices here, on our stair ropes and rope hand rails site. 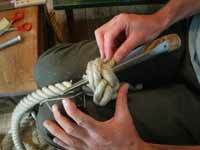 The marlinspike is a steel or wooden lever used to work tension into knot construction. 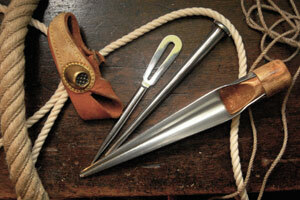 A traditional sailor or on-site rigger will use this and a knife as their only tools. With the space of a workshop or rope loft an ever expanding series of tools has become available, perhaps the most useful being the fid, a grooved spike used to open a pathway between strands. For anyone who is interested in pursuing the craft of ropework, history and techniques of knotting, there are countless books and web sites to explore; the seminal book on the subject is "The Ashley Book of Knots" by Clifford W. Ashley. All content on this website is © (copyright) 1994-2019 - Stonk Knots and StairRopes.com, unless otherwise stated. Web site design and photography by Witches of The Web.